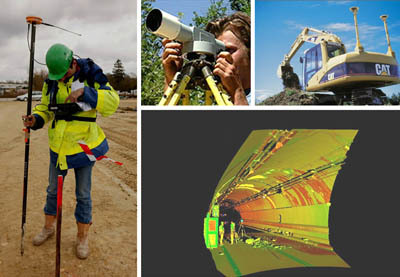 The land surveyor is involved in taking measurements using different techniques at every stage of a project. In essence, the land surveyor’s role consists of measuring all types of data (angles, distances, altitudes) in order to define the layout of areas of land and the geographic position of different objects. These might include buildings, infrastructure (roads, railways etc), as well as the topography of the land itself (forests, rivers etc). Once the data has been obtained and recorded, it is then used for a variety of purposes. Topography is indispensable at the different stages of a public works project, with each project presenting a particular challenge according to the specifics of the land and the works being carried out. It is also used in many other areas, from delineation of land ownership to the preservation of the environment. The techniques used for measurement have evolved rather slowly and unevenly over the years. However, a rapid acceleration has taken place in the last few years with the advent of the use of GPS. It can be said that today topography is truly the height of technology, whilst at the same time conserving a hidden dimension linked to the different conditions of each project! Better yet, it is an integral part of the birth of a new discipline which is now emerging - geomatics engineering. The authors would particularly like to thank SETRA, Leica Geosystems, Miretopo and Scanlaser, as well as Mr. Francis Delagarde and Mr. Gérard Forquet for their support in the production of this report.